Ryanair: kings of the customer experience. 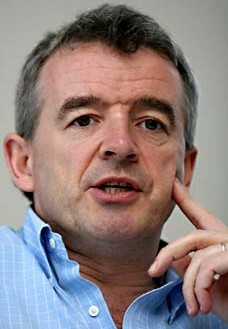 Michael O’Leary is the CEO of Ryanair, a European budget airline headquartered in Ireland. The quotes above are some of the things he has said at press conferences and results announcements over the years; this thinking is reflected in the uncompromising ways in which the company operates. In many ways, he is the antichrist of orthodox customer experience thinking. According to much customer experience orthodoxy, Ryanair should be in serious trouble. Poor customer experience should result in customer dissatisfaction, disloyalty, social media backlash and poor brand reputation. But here’s the thing. The customer experience Ryanair offers does not affect the bottom line. In fact, one might argue that it is a major reason for Ryanair’s consistent, spectacular bottom line growth. Ryanair has just announced yet another set of stellar annual profits. To March 2013, the airline made operating profits of €718m ($924m) on revenues of €4.88bn ($6.28bn), up 11% from last year. And this is no flash in the pan: Ryanair consistently grows revenues and profits every year. Ryanair is a company that likes recessions. Something is amiss. And on the basis of the company’s sustained growth and returns, it doesn’t look like it’s Ryanair. So is received customer experience wisdom mistaken? And if so, does this mean that we should abandon our efforts to improve the customer experience? Just the opposite. Ryanair succeeds (and its CEO is noteworthy) precisely because it is one of the few companies to have understood exactly the customer experience that it needs to compete strategically – and then makes sure this is what it delivers. Ryanair is a lean, low cost airline. It sets expectations for customers about how it works and what it will and (and particularly) won’t do. It does not burden itself with the very high costs associated with exceptional customer service, because it offers very little by way of customer service. This is why O’Leary is so uncompromising about refunds – because if Ryanair compromise on this once, they will have to do it again. And then they will need to employ people to manage refunds. And they will get more complaints, because customers will think that they might get something by complaining. So Ryanair will have to staff a complaints department. And this will lead to escalations, and reporting, and budgets, and bureaucracy, and management’s attention will get distracted by customer issues, and this will take their eye off the ball of running things very cheaply and efficiently. And at that point, their cost base will have ballooned and they will no longer be competing on cost. (And then their competitors will kill them by competing on service). Instead, Ryanair are very explicit about the customer experience they offer. They are low-cost. They will get you there, on time. With your bags. That’s it. No other promises. They deliberately limit the customer experience and manage it tightly because doing so is essential to their strategic success. And against these things – the things which, because they really understand their customers, they know are most important to them – Ryanair are among the best in Europe. And this is the lesson Ryanair teaches all of us about the customer experience. We must not fall into the trap of blindly accepting that our goal is to make things a great as we can for customers. This is not the purpose of customer experience transformation. Our purpose is instead to specify, build and deliver the customer experience we need in order to meet our organisations’ strategic goals. And then we must drive this experience as ruthlessly and singlemindedly as Michael O’Leary drives Ryanair to succeed. Ryanair and Michael O’Leary are, in effect, posing each of us a very challenging question: what is the customer experience our companies need to offer so that we can best meet our strategic goals? PS I hate flying by Ryanair, but I do so when I have to. Thanks for the comment and I really like your article, even if I don’t wholly agree with all of it. I recommend that any reader interested in my post above should also have a look at yours for a different perspective.